Last night Clio and I went for a walk after dinner, as we almost always do. It wasn’t even close to 8 o’clock yet, but it was getting dark. There was a chill in the air, but we could feel the warmth radiate from the wall of rocks, which had soaked in sunshine all day. Earlier in the day, we’d seen that someone had stuck a piece of tassly grass into the trunk of a tree. It looked like a little bouquet, or a little spray of fireworks. However, at dusk, it seemingly took its true form. The spirit of the end of summer. 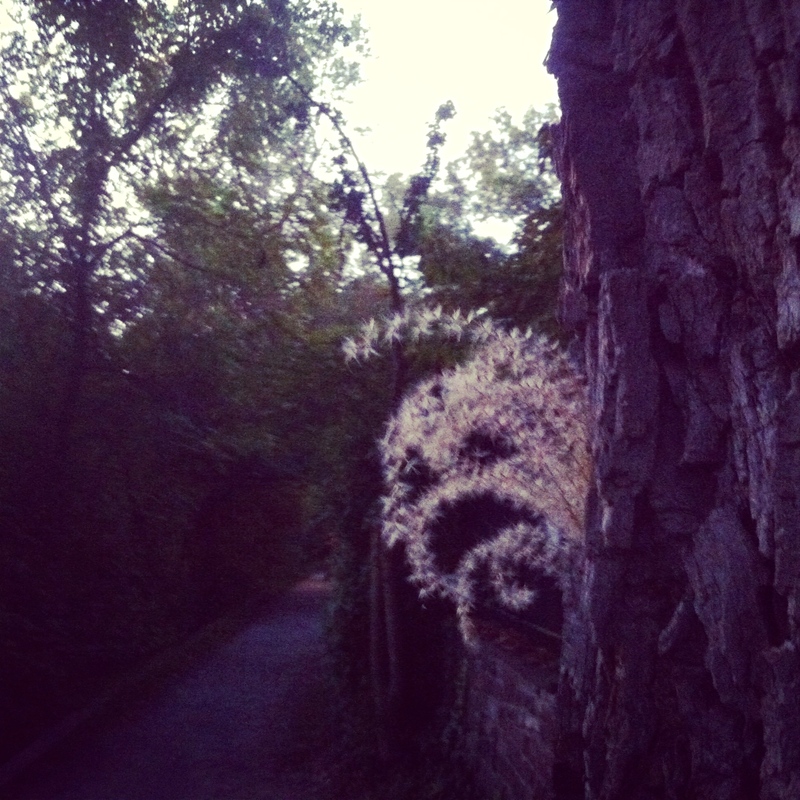 He’s laughing at us from behind a tree, full of mischief, but a little sad, too, maybe even slightly scared. He seems substantial, but if you run your hands through his tresses, as we did today in the bright afternoon light, he falls to nothing. Through his winking eyes and gaping mouth, you can see the beautiful darkening light along our towpath, and watch the leaves fall like bright shadows. This tart contained many of my favorite flavors. It was fun to make, and I realized I hadn’t made anything slightly complicated in some time. It’s not complicated as in difficult, but it does have a few steps, a few layers. The first is a sweetish buttery crust. But you don’t roll it out, you just press it down with your hands, so it’s not that hard. The second layer is bittersweet chocolate. I melted the chocolate chips over a low heat till they were just soft, and then spread them into a thin layer with the back of my spoon. The third layer is a frangipane, but on the firm side, not too custardy. And finally, of course, the fruit! 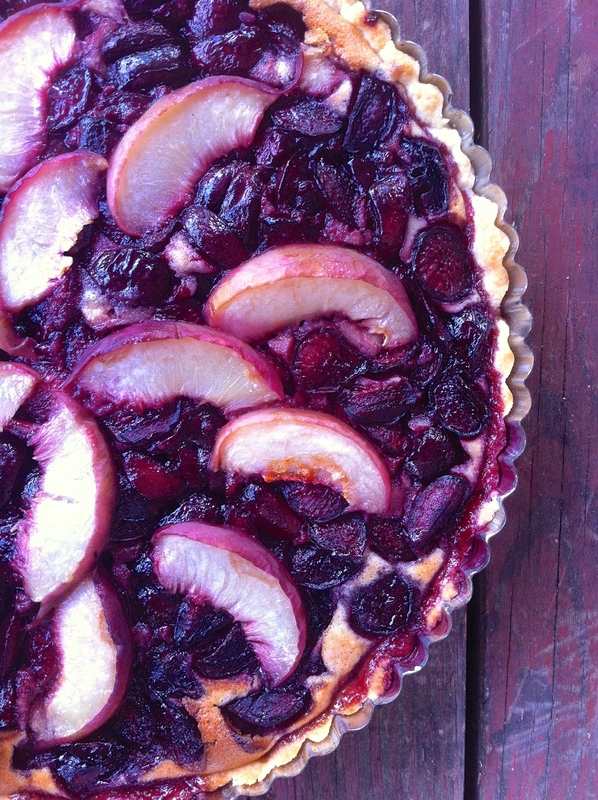 I like the rich, tangy, sweet but not too sweet quality of this tart, and ate if for breakfast and before bed for days. We also ate it with whipped cream and vanilla ice cream, and I recommend these presentations as well. Here’s The Ethiopians with Feel the Spirit. Love this one. Combine everything in a food processor. Add just enough water (a few tablespoons) to pull everything together into a soft ball. Lightly butter a tart pan. With the heel of your hand, lightly floured, press the dough into the pan and up the sides. Chill while you preheat the oven to 350. Bake for about five minutes until it loses it’s shine. If the sides start to fall, press them up carefully with your fingers. Bake at 350 for about half an hour, till the cherries are bubbling hot and the crust and frangipane are golden brown. Let cool and set before you try to de-pan it or slice it. 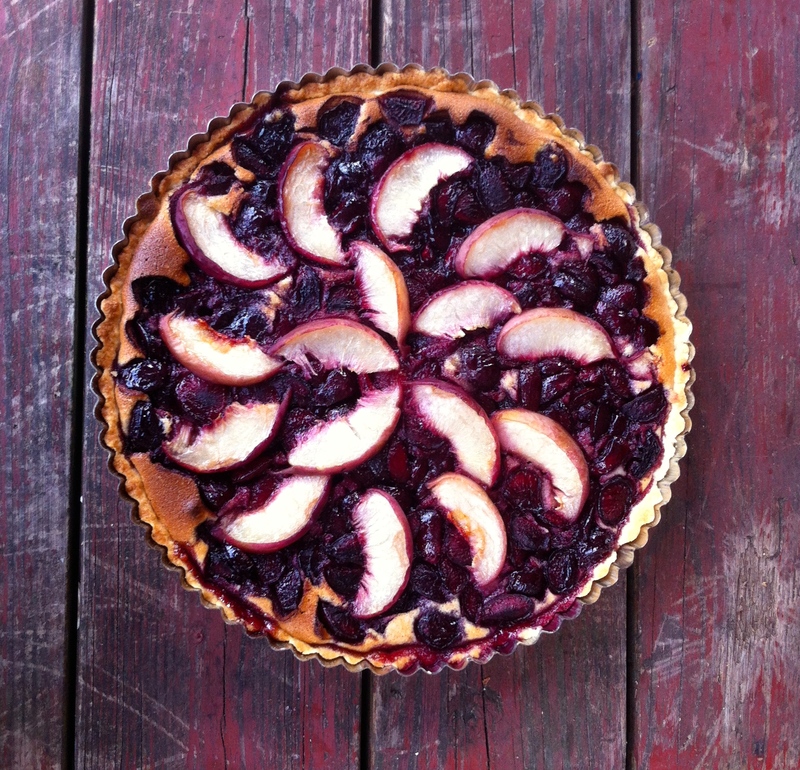 This entry was posted in basic pie filling, cake, chocolate, cookie, crust, dessert, recipe and tagged almond and chocolate, cherry and chocolate, cherry tart, frangipane, peach tart, white peach by Claire. Bookmark the permalink. I think your spirit is on tour, he’s definitely been lurking around our forest this week… we got drenched this morning, though Luna had lots of fun in the drainage ditches at the side of the path… she likes to “bury” her Kong in the clay at the bottom and then try to dig it out… she ends up looking like one of those chocolate coloured labs. It’s also hilarious when she tries to “sniff” for it with her muzzle underwater, and only ends up blowing bubbles. The tart looks fantastic, will try to get myself organised to make that for our US neighbours who are heading back to the States next week. It seems like there would be a word for “Spirit of the end of summer” in German! They must have a word for that strange kind of ending/beginning nostalgia you feel. Steenbeck used to hide her toys, but Clio doesn’t. She just leaves them all over the floor so that we trip on them in the middle of the night. I quit my horrible waitressing job and now I have a better job writing from home. If anything, Clio has become more bonded to me than ever, she follows me everywhere I go. Velcro dog. Needless to say, I love it! Vergänglichkeitsnostalgie would be the nostalgia you feel for the awareness that things are coming to an end, or the temporarity of things.. (that isn’t necessarily a common usage but the beauty of the language is that you can make up words for most abstract concepts). Velcro dog is hard to resist… I have an overnight trip tomorrow and I’m already missing Luna. I see people walking their dogs on paths through the train window and I wish I was outside with mine. Glad you could dump the waitressing btw, that seemed like a very depressing situation. The tart went down really well, I did manage to glue the base to the pan but taste-wise it was a hit… no cherries to hand, all I had was a (thawed) frozen berry mix of boysenberries, blackcurrants, redcurrants, raspberries etc. but it seemed to balance sour and sweet as the cherries might have. And I finally used that packet of sliced almonds I bought a while ago for whatever reason. My neighbours- who will shortly become your neighbours, in a sense- they are moving to NC- ate it all up, in any case. Think how happy Luna will be to see you when you get home! I half want to walk around the block and sit in the park for a bit just to see Clio happy to see me. She used to wait in the doorway and start to creep down the sidewalk when I was about a block away, and then go completely bonkers. Funny girl. Vergänglichkeitsnostalgie! What a perfect word. I’ll try to work it into casual conversation at least once a day. It must be fun to write in German, if you can combine words to make new ones. I suppose you can do it in English as well, but it would look strange. And I’m glad the tart worked out. I’m always nervous when someone tries one of my recipes. I’m sure it was delicious with blackcurrants, raspberries, etc. I have some blackcurrants frozen from earlier in the summer when our bush was producing more than we could eat. I’ll try it that way! With some raspberries, too. Can’t wait.